Last weekend saw the return of the Melton Mowbray Cheese Fair (I’d link to the website but it still only has a list of last year’s exhibitors), it’s actually billed as the “artisan” cheese fair but many of the exhibitors could hardly be called artisan, Long Clawson for example makes over 6,700 tonnes of cheese a year and I’ve worked in one of the other cheese factories that were there and they are about as far from “artisan” as you can get. There were much fewer cheese exhibitors this year, many of the artisan producers that were there last year were absent this time round bar a handful, but with the term “artisan” being used so loosely to include huge cheese manufacturers I don’t really blame them for wanting to distance themselves from something that devalues the true meaning of the word so carelessly. I went along on the Sunday and was pretty shocked, not by the lack of small producers which I’d kinda expected but by the sheer rudeness of so many of the show’s visitors. It seemed entirely appropriate that it was held in a cattle market as people paid their £1 entrance fee many pushed and shoved and grabbed greedily at samples before just walking off. Everyone I spoke to in the days following the event said the same thing: “we saw people literally grabbing the knives off the tables and hacking lumps of cheese off from the producer’s tables and then just walking away.” It was depressing. Full credit to the traders though who I think must have all taken some super smiley pills because they were all incredible gracious and friendly in the face of such rudeness. I would have had people leaving my stall with toothpicks protruding from their eyes and hands after several hours of this so huge respect to all of them. I gave up on moving around the stalls after my desire to whip out a cattle prod grew too intense and opted for a pint of Natterjack cider to calm me down, then an ale and watched the Melton Ukelele Orchestra who were absolutely ace, they played Paint it Black by The Rolling Stones and it totally made my day. Things had quietened down a bit by then (perhaps the morris dancing had something to do with it) so I headed round the stalls to talk cheese. 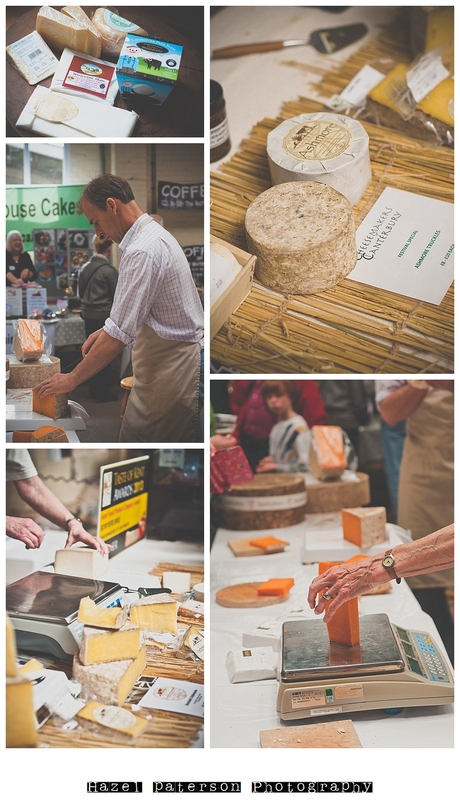 It was great to see David from Sparkenhoe there again (middle left on the picture above), THIS my friends is what Red Leicester is meant to taste like, its nutty, creamy, unpasturised and made on their farm using their own herd. Unsurprisingly the hands down flavour winners of the day were the unpasturised (raw milk) cheeses, of which I bought about 8 different ones (Keens cheddar, Chorlton smoked and unsmoked Cheshire, Laverstock buffalo mozzarella, Teifi’s Celtic promise, and 2 from the same producer whom I can’t remember the name of) which were all wonderful but my favourite of the day was Kent’s Winterdale Shaw which is Britain’s first carbon neutral cheese. Next time I’m down in Kent I’m going to head over to see them, they are a lovely family making great cheese using their own cows, just the kind of people and cheese that make this country’s food heritage something to be proud of. I think it’s a bit sad to say that it shouldn’t be open to smaller cheese manufacturers. It’s not like Cathedral City were there and Stilton has to be pasteurised as part of the PDO. Hope your comments are taken on board for next year! I didn’t say it shouldn’t be open to smaller cheese manufacturers at all, I said if you call some thing an “Artisan Cheese Fair” then that’s what it should be otherwise just call it a cheese fair. I didn’t say anything about Stilton in my post? Ah good point. I just was picking up on your comments regarding the best cheeses being unpasteurised. Personally I feel the best cheeses are, I disagree with the fact that they decided to make all Stiltons Pasteurised in a knee jerk reaction and am supporting Stichelton Dairy’s application to DEFRA to amend the PDO. Stilton was made with raw milk up until the ’80s. If you want to eat cheese that is made with love in the way stilton was traditionally made then Stichelton is the one, beats pasteurised blue cheeses hands down in flavour.